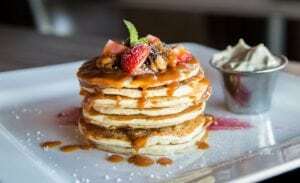 Pancake is a traditional dish of North America, popular both in the US and in Canada. 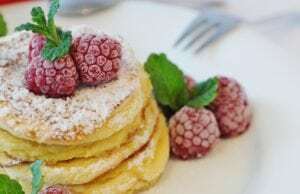 In these countries, pancakes are an integral part of breakfast, but residents of other continents have appreciated them for a long time – today this delicious pastry is included in the menu of cafes and restaurants around the world. The origin of the pancakes is not known exactly (perhaps the recipe was brought to America from the Old World by Scottish emigrants), but that today is one of the most popular desserts in the US is indisputable. They are easy to prepare, so a rare breakfast does without pankakes, but for family tea at any time of the day these pancakes are quite suitable – it is unlikely that there will be at least one American sweet tooth, capable of abandoning a pile of fragrant, lush, tender pancake, covered with maple or chocolate syrup , whenever they were offered to him. By the way, even if the honor of the invention of the recipe belongs to immigrants from Europe, the pan for pancakes is an absolutely American invention. With the help of such a frying pan, pancakes are baked very quickly and do not need to be turned over. Pancake are an original and tasty dish that you should learn to cook. To make pancakes really delicious, you need to mix separately dry ingredients, separately – liquid and only then connect them. In a deep bowl or bowl for a mixer, pour a glass of milk, shake 1 egg, add 3 tablespoons of olive oil. Olive oil can be replaced with the same amount of melted butter. Beat the resulting mixture with a mixer, whisk or fork. In another container, connect 1.5 cups of wheat flour, 3 tablespoons of sugar and a pinch of Vanilla, 1/4 teaspoon of salt and 1 teaspoon of baking powder, and then mix. After combining the liquid base with a dry one, mix them until a homogeneous mass is obtained. Prepared dough should be used immediately after preparation, otherwise the baking powder will cease to function, it will settle, ceasing to be light and fluffy. Heat on the stove dry (without adding oil!) pan, pour onto it 2 tablespoons of dough, forming a future pancake, then 2 more spoons, and then until the entire pan is covered with dough slices. Once the bubbles appear on the surface of the pancakes, turn them over with a spatula to the other side. On the frying of the pancake on the other side of the time it will take even less.